I love my skin and I hope you love yours too! It keeps us put together in a beautiful package, protects our skeletal system and organs, and is one of our first defense systems. If you think about it, it’s really one of the first things that people see when they look at you. If you are like me and interested in facts that may come up in a handy in a game of trivia or impress someone in a conversation, then here are some really interesting skin facts about your skin. The skin contains a pigment known as melanin. The darker skin has more melanin, less melanin makes it lighter. 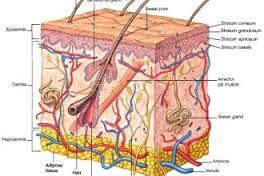 Your skin is made up of three layers. So how many skin facts did you know and did you learn any new interesting skin facts to share with your friends? We hope you share these skin facts as your skin plays an important role in your life, without it, we would all just be hanging out! If you love your skin like we do, you are sure to love what J Bio Serums will do for your skin!